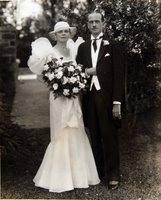 Catherine married wealthy attorney Philip Leidy in 1933. With Philip’s financial support and the encouragement of conductor Leopold Stokowski, she established the Philadelphia Ballet Company two years later. She found her niche creating ballets with uniquely American characters and settings using music and designs by American artists, works that showcased the youthful enthusiasm of her dancers. Catherine was so well respected as a teacher that in 1933 George Balanchine recruited a number of her students to form the nucleus of his first American school and company. In 1940, a handful of her students were on the roster of the newly formed company Ballet Theatre.